The first owner of the beautiful Gtachina Estate was the favorite of the Empress Catherine II – Count Grigory Orlov. In 1766 he had started to build a palace here, under the supervision of the architect Antonio Rinaldi. The Catherine’s son – Duke Paul Petrovich, had settled in the palace after the death of Gregory Orlov, in 1783. Paul I put Gatchina to the status of the city and adopted it’s emblem, which depicts a traditional Russian double-headed eagle. At that time the palace had undergone a serious modernisation, held by another Italian architect Vincenzo Brenna, and it keeps that shape till nowadays. After the death of Paul I, the Palace belonged to his wife Maria Feodorovna, and later, to emperors Alexander II, Nicholas I and Alexander III. 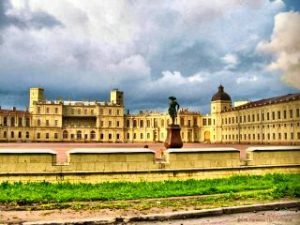 The palace of Paul I looks different than other Imperial Palaces around Saint-Petersburg. It is not decorated with gilded baroque elements and sculptures. However, this does not diminish its value as a monument of architecture. The facade of the palace is decorated with natural stone. This practice in construction was used for the first time in Russia here. And the tour of the castle you can see the Antechamber, the Marble Dining room, the Throne room of Paul I, and other carefully restored interiors of the palace.